For a long time Little Sis has been obsessed with Peppa Pig. Thankfully she’s recently become interested in other toys and has been building up a little collection of Sylvanian Families, or ‘Families’ as she calls them. I remember them from my own childhood so I’m pleased to see they’re still going strong. Created in Japan in 1985, Sylvanian Families is made up of woodland creatures, dolls houses and furniture sets. 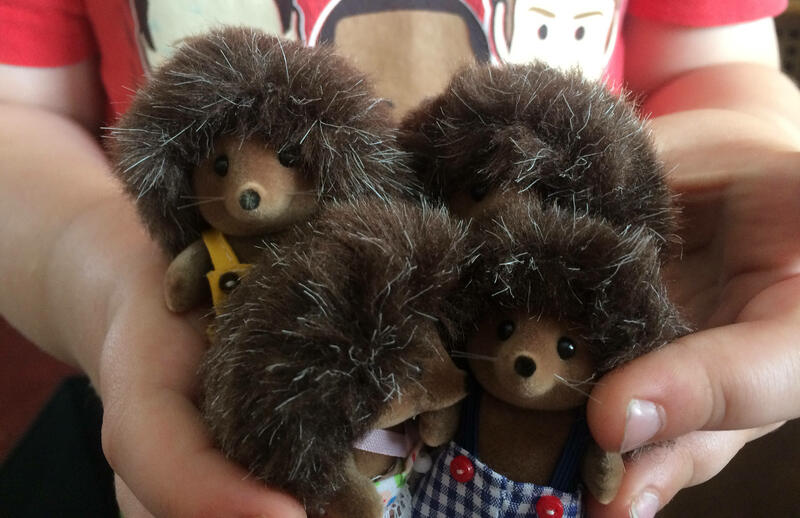 The Bramble Hedgehog Family were recently introduced and Little Sis was sent a set to review. With their soft bark-brown spines, wide eyes, and button noses, the Bramble Hedgehog Family are easy to spot! This prickle of hedgehogs come complete with their own combs and brushes to tame their furry quills. The Bramble family are really active and they’re nifty climbers, determined burrowers, and they like to splash around in the lake too! That is, unless it’s winter time, in which case, you’ll find them nibbling berries and taking naps! All Sylvanians enjoy being outdoors, and Father Mortimer Bramble is no exception! He likes nothing more than tending to his vegetable patch. Mother Eleanor Bramble has a smile for every situation, and she always has her comb to hand in case the little ones’ tresses get all tangled up. Their eldest Maxwell is as cute as the post-box red buttons sewn onto his dungarees. His sister Abigail is a stylish little hedgie. This is a great addition to the range. They are lovely soft and I like the inclusion of the combs and brushes. Little Sis has been having lots of fun with them and I think she’ll be getting a few more Sylvanian Families for her upcoming birthday. Ahead of its 30th anniversary next year, Sylvanian Families today launches a national photography competition aimed at British fans of this iconic toy brand, and is offering a top prize of Forest Holiday worth £1000 to the winner. 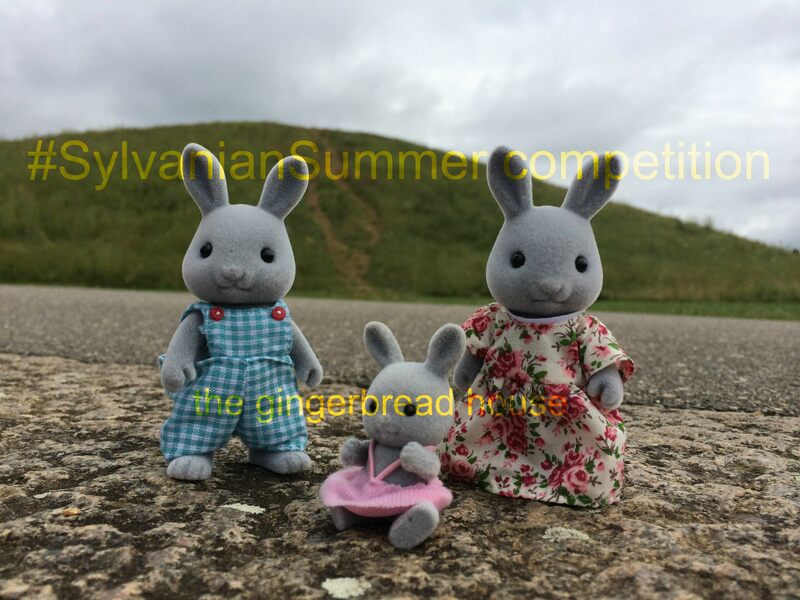 Running throughout July and August, the #SylvanianSummer competition encourages UK-based fans of all ages to use social media to upload eye-catching photos of their Sylvanian toys enjoying the summer (whether on holiday abroad or at home) using the hashtag #SylvanianSummer. There are over £1,400 of prizes to be won, including a £1,000 Forest Holiday in a log cabin or treehouse in the UK. Winners will be chosen by a panel of judges including the Guardian’s Life and Style Editor, and a toy photographer. You can enter multiple times – here’s one of our submissions! Closing date for entries is midnight on 31st August 2014. (More information on how to enter and terms and conditions relating to the competition can be found on www.sylvanianfamilies.net/uk/news). The competition winner and runners-up will be announced in September. How sweet are those hedgehogs?! I want these sooooo much. Why haven’t I got younger kids……Its just not fair. Maybe I should make a start collecting them now for future grandchildren. What do you think ? Oh my word these are the cutest!! My cousin had pretty much every SV family thing there was when we were little back in the 80’s and I was always so jealous! we love sylvanian families! my littlest two have loads of them! Aw they are soooo cute! I know nothing about Sylvanian families but how cute are these?! How cool. Thank you sharing this great competition. It sounds like a nice summer project. I wish I had enough money and space to buy the lot of them! Far too cute. I love I hedgehogs – they are super cute!